RNA is a labile biomolecule that can be cleaved by RNase and is rapidly degraded in human plasma. In using RNA origami as an anticoagulant, the stability of RNA origami in human plasma is essential. To improve the stability of RNA origami, modified NTPs (2'fluoro-CTP and UTP) were used as building blocks for in vitro production of RNA origami. The modified RNA origami is stable in 10 µg/ml of RNase A for at least 6 hr and in a high concentration of RNase A (500 µg/ml) for 30 minutes. As we expect, the non-modified RNA origami is degraded in the RNase solution within less than 10 minutes. In human plasma, the modified RNA origami is stable for more than 24 hr, while the non-modified RNA origami is degraded within less than 10 min. DNA is a fairly stable biomolecule in harsh condition including human plasma. We found that DNA tiles are stable in human plasma over at least 6 hr. We have also concluded that the modified RNA origami is more stable than DNA tiles in human plasma. To test the stability of RNA origami under RNase-containing conditions and in human plasma. RNA is a functional biomolecule that plays a crucial role in cell biology, such as in gene regulation, microbial and viral defense, and as the main messenger in the central dogma of molecular biology. The chemical stability of RNA is tuned for its roles in cellular and physiological conditions, but its short half-life in human plasma is not suitable for a circulating drug. To exploit the benefits of functional RNA for therapeutic purposes, the stability of RNA is one of the main challenges. The 2' modification of the ribose sugar has been widely used for the improvement of stability of RNA under nuclease-containing conditions such as in human blood plasma (Figure 1). (1-3) Pieken et al., 1991, reported that adding 2'-fluoro- and 2'-amino-modified nucleotides into ribozymes vastly increased their resistance to ribonuclease degradation. Importantly, 2'-fluoro-dCTP and 2'fluoro-dUTP did not affect the catalytic activity of their ribozyme. In our project, we therefore chose 2' fluoro-CTP and -UTP as building blocks for in vitro production of RNA origami. Figure 1 (A) Native nucleotide, Cytidine-5'-Triphosphate (CTP) and (B-D) modified nucleotides : (B) 2'-fluoro-2'-deoxycytidine-5'-triphosphate (2’F-dCTP), (C) 2'-amino-2'-deoxycytidine-5'-triphosphate (2'-amino-dCTP) and (D) 2'-O-methylcytidine-5’-triphosphate (2'-O-Methyl-CTP). Cytosine, ribose sugar, triphosphate, and 2’ modification are indicated in green, blue, orange, and yellow rectangle, respectively. To test the stability of RNA origami in solutions containing RNase A, the non-modified and modified RNA origami was incubated with RNase A (10 and 500 µg/ml) at 37°C for 10 minutes up to 24 hours. 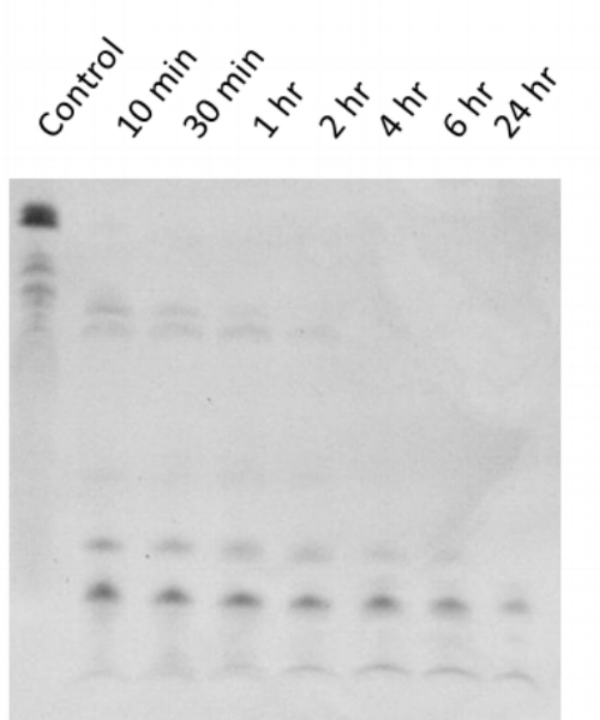 The integrity of RNA origami was characterized using denaturing gel electrophoresis (Figures 2 and 3). As results show in Figures 2B and 3B, the non-modified RNA origami is completely degraded in RNase A-containing solution within 10 minutes. The 2'-fluoro-CTP and -UTP modified RNA origami is stable in 10 µg/ml RNase A for at least 6 hr and some is still observed after 24 hr (Figure 2A). At high concentrations of RNase A, the modified RNA origami was stable for 30 minutes as shown in Figure 3A. Figure 3 The stability test of modified (A) and non-modified RNA origami (B) treated with high concentration of RNase A (500 µg/ml). The samples were characterized by denaturing gel electrophoresis. For therapeutic applications, reasonable stability of anticoagulants in human plasma is needed. Human plasma contains multiple nucleases that rapidly degrade DNA and RNA. Here, we tested the resistance of RNA origami and DNA tiles in pooled human plasma. Denaturing gel electrophoresis was used to characterize the integrity of nucleic acid nanostructures. The RNA origami and DNA weave tile were incubated with human plasma at various time points from 10 minutes up to 24 hours. The 2'-fluoro-modified RNA origami was stable in human plasma over 24 hours as shown in Figure 4. Notice that the intensity of the top band in figure 4A, lane 2 increases compared to lane 1; this shows that some RNA origami is binding thrombin or other large aggregates in the complex environment of human plasma. Not surprisingly, the non-modified RNA origami was degraded within less than 10 minutes (Figure 5). The DNA weave tile is stable in human plasma for at least 6 hours but less than 24 hours (Figure 6). These results demonstrate that the 2'-fluoro-modified RNA origami is more stable than the DNA tile in human plasma. Figure 5 Stability test of non-modified RNA origami (2HO-RNA-2NN1) stored in human plasma at 37°C from 10 minutes to 24 hours. Figure 6 Stability test of DNA weave tile (2HT-DNA-PNNB) stored in human plasma from 10 minutes to 24 hours at 37°C. The native RNA origami is degraded by ribonuclease within less than 10 minutes. To employ a functional RNA origami for therapeutic applications, increased stability is required. We found that the 2'-fluoro-modified RNA origami is stable in RNase A for at least 6 hours. Interestingly, the modified RNA origami is stable in human plasma over 24 hr and is more stable than DNA tiles. The stability of the 2'-fluoro-modified RNA origami in human plasma over 24 hours demonstrates that the RNA origami is a promising biomolecule for use in therapeutic applications. For folding RNA origami, the non-modified and modified RNA origami dissolved in nuclease-free water was heated at 95°C for 5 min and quickly cooled down, at -20°C for 3 min. Then, the samples were mixed with 5x annealing buffer to get concentrations at 1x buffer and annealed at 37°C for 30 min. Finally, 1x buffer was added into the folded RNA origami to get the desired concentration. The folded RNA origami (1 µl,5 µM) was mixed with RNase A (1 µl of 10 and 500 µg/ml) or human plasma (3 µl) and incubated at 37°C for various time courses from 10 min to 24 hr. The integrity of RNA origami was characterized by denaturing gel electrophoresis. For the denaturing gel electrophoresis, the gels were pre-run at 20 W for 15 min, and the samples were run at 20 W for 1 hr. Finally, the gels were stained with ethidium bromide for nucleic acid staining. The nucleic acid bands were visualized under UV illumination in a ProteinSimple gel documentation instrument. Layzerm J. M., and Sullenger, B. A., Simultaneous generation of aptamers to multiple gamma-carboxyglutamic acid proteins from a focused aptamer library using DeSELEX and convergent selection, Oligonucleotides. 2007, 17, 1-11.